More new Taylored Expressions projects. Hope you are all having a great weekend! I planned for a relaxing weekend and weather seems perfect with rains. 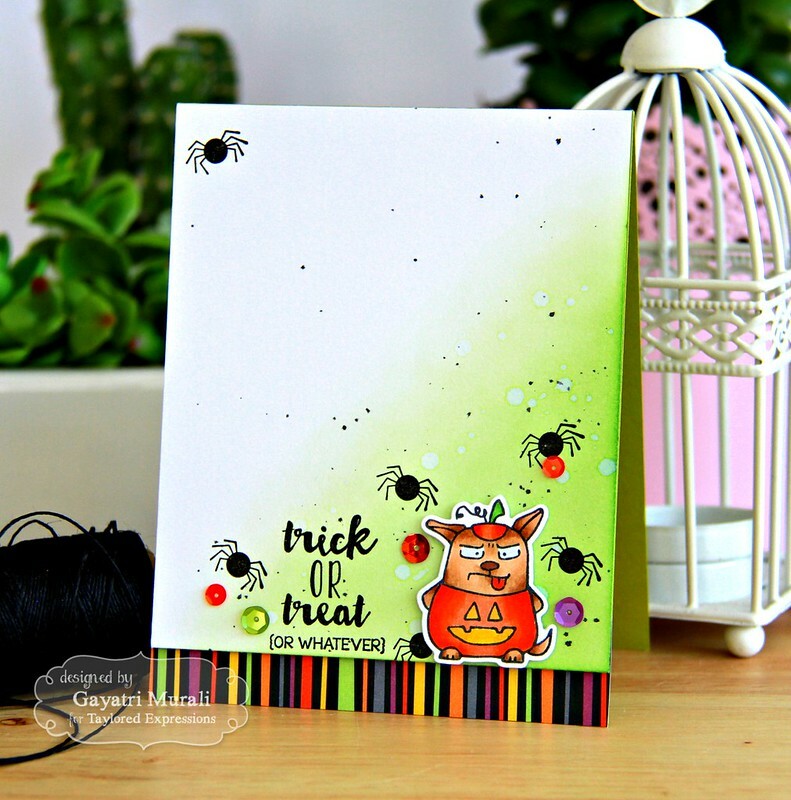 Today I am sharing some more of my projects using the newly released Taylored Expressions products. There are plenty of new goodies released yesterday and they are all available to purchase at Taylored Expressions shop. 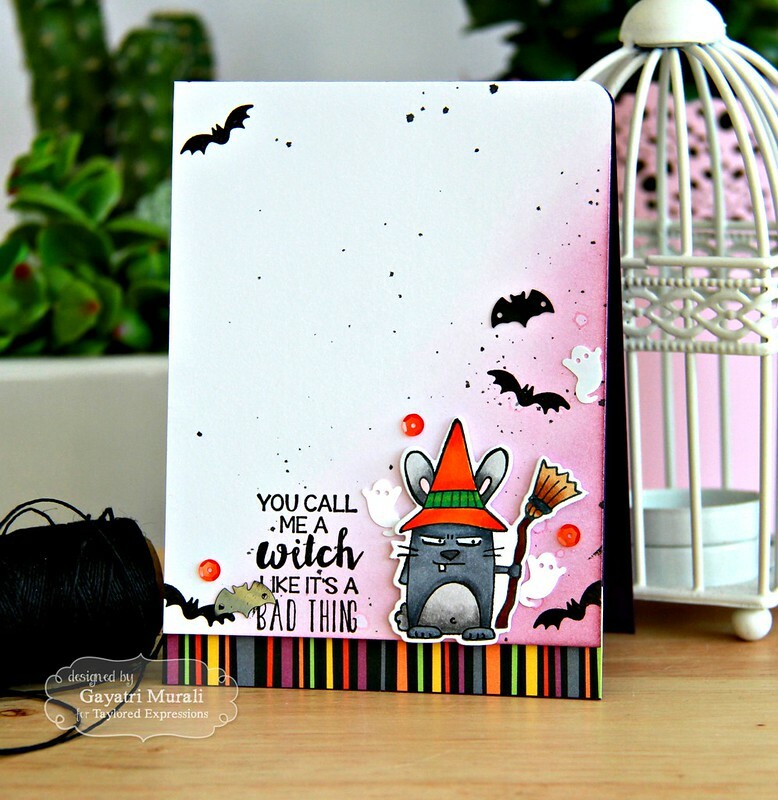 My projects today uses Grumplings in Costume stamp set, Witch’s Brew stamp set and coordinating Grumplings in Costume dies. I have a set of five cards using these sets. There are a lot of photos so enjoy! The layout or the sketch or the design of the cards are exactly the same with differences in the Grumplings, colours, sentiment and sequins. I started with five white cardstock panel trimmed to 4 1/4″ x 5″ in size. I then spattered all of them with Black Soot distress ink and left them to dry. 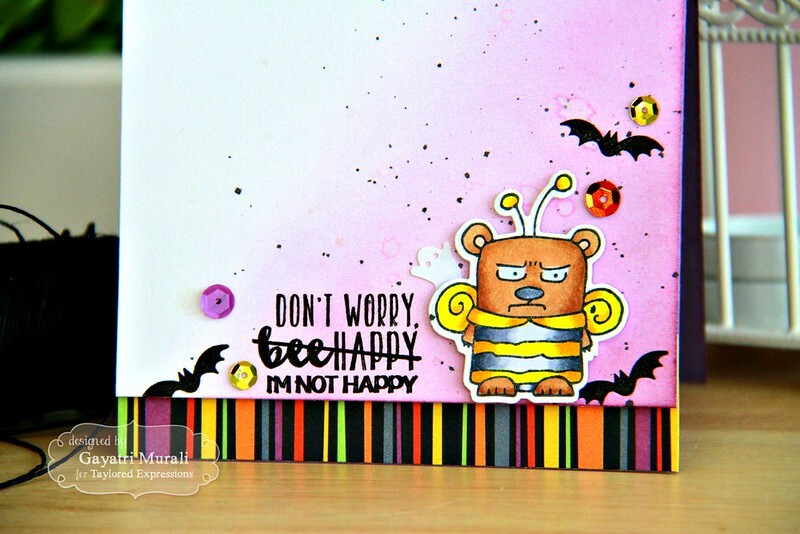 In the mean times, I stamped, copic coloured and die cut the five Grumplings. Now I went back to the panels and sponged Mowed Lawn, Dusty Concord and Spiced Marmalade distress inks on the bottom right corner of the panel. I then spattered some clean water on them and left it to dry again. 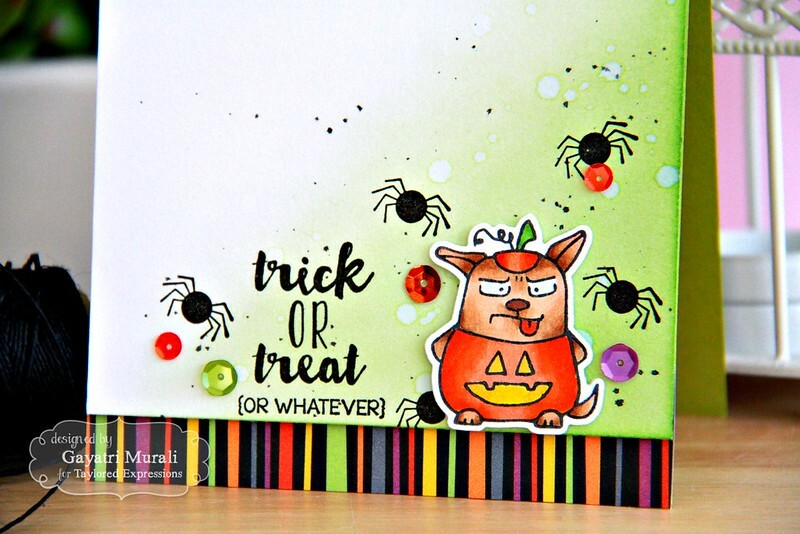 I made my card bases and also trimmed the striped pattern paper from Taylored Expressions Build A Scene: Halloween 6×6 paper pad to 1 1/2″ x 4 1/4″ in size. I again came back to the panels to stamped the images from Witch’s Brew in black ink randomly by placing the Grumplings in its place as a guide. I also stamped the sentiment keeping the Grumplings in its place as a guide. Then I adhered the Grumpling using foam adhesives for dimension. I adhered the stripped pattern papers to the bottom of the card bases, then the panels to the card base using foam adhesives. On some of the cards, I round one corner. Finally embellishing with some sequins from Build a Scene: Halloween sequins. 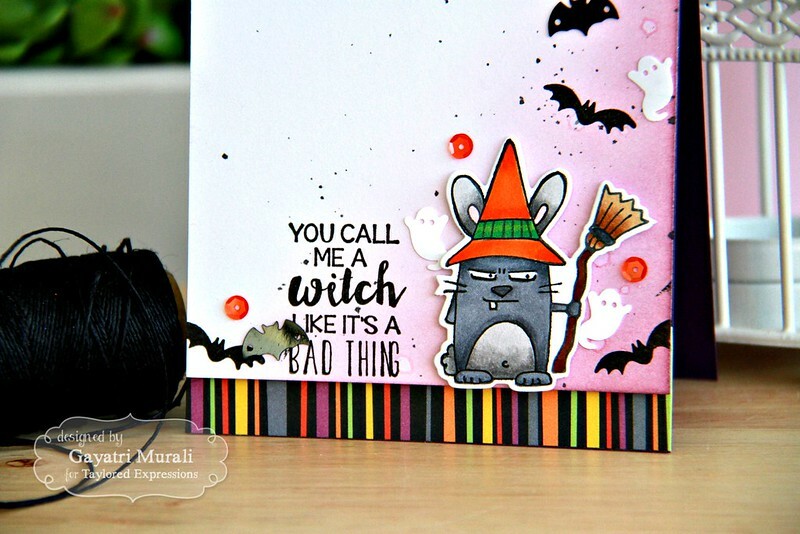 I absolutely adore the Grumplings in Costume stamp set and coordinating dies. 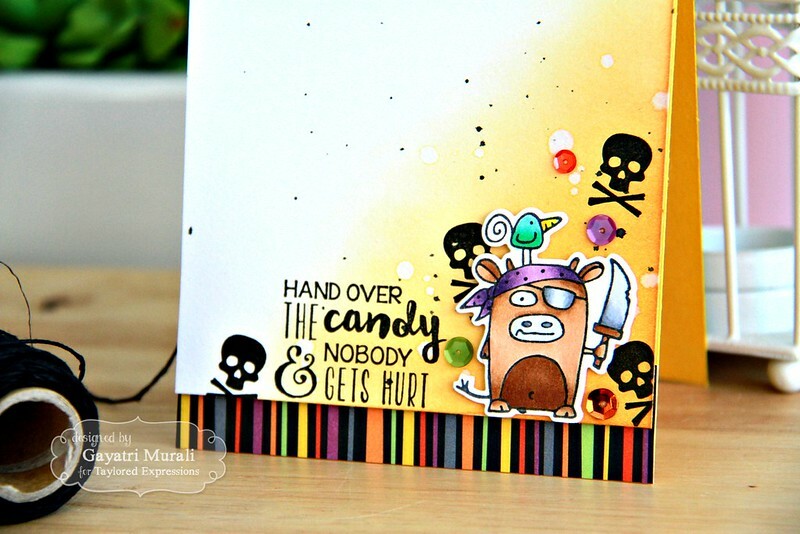 So cutely scary 😉 These stamp set and dies are available to purchase from Taylored Expressions shop. It was supposed to read “Gayatri”! These are totally charming. 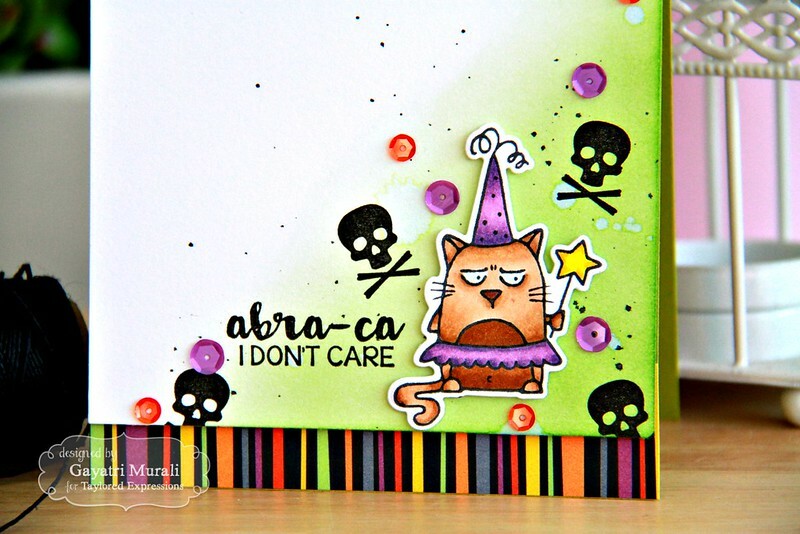 I love the wash of color and the sprinkle of sequins and spiders behind these grumpy guys! Ooh my gosh! Awesome set of cards, and I looove that stamp set! So hilarious! Oh you stinker, I might have to get these! Omgoodness! They're all adorable, but the last one just perfectly reflects the grumpiness of the character. Made me smile. Thanks! These cards are hilarious and so cool!!!! F U N ! C U T E ! D E L I G H T F U L L Y S P O O K Y !!!! Seriously? It's like someone created a stamp set specifically for me! haha I absolutely adore these!! Thanks so much for sharing. A www man if I knew these existed I'd already own them.i just adore what you have done on the cards with them. Perfectly executed. I have to say this is the first time I have EVER been tempted to buy a halloween set. You surpass yourself. They are wonderful.